Hello blog world! 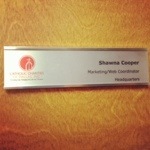 I accepted a job this week as the Marketing and Web Coordinator for the Catholic Charities of Dallas. After four months of unemployment, this opportunity is such a blessing. I will be using my background in social work and journalism to help tell the stories of the good works Catholic Charities of Dallas. I’m so excited to use my journalism degrees!